It’s that time of year again… Time to raise money and a truckload of toys for the kids at Casa Pacifica. 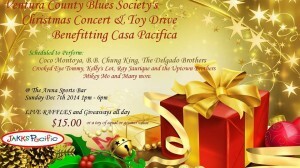 Each year The Ventura County Blues Society holds a benefit concert and Toy drive to help Casa Pacifica. This year we have an amazing line up of musicians for you. How about the one and only COCO MONTOYA… A legend in his own right and someone who brings it every time he picks up a guitar. ALL OF this to Benefit Casa Pacifica..